A young woman and child are discovered starving and severely dehydrated inside a locked cellar during renovations at the house next door. Extremely traumatised, it's some time until the woman, Vicky, can be properly interviewed. The homeowner, Dr William Harper, is an elderly widower in his 70's who has arthritis and Alzheimer's disease. As unlikely as it seems, could he have abducted the woman and held her captive in his cellar with the child? To further complicate matters, Dr Harper's home is opposite the flat where missing BBC journalist Hannah Gardiner lived with her husband and toddler son. Is it possible Dr Harper was involved in her disappearance too and if so, where is she now? In the Dark is the second book to feature Detective Inspector Adam Fawley. Having thoroughly enjoyed the first, this is fast becoming a must-read British police procedural series. This second book didn't disappoint. Set in Oxford, it had so many unpredictable twists and turns that my head was literally spinning. It was exceptionally well written by a very talented author. The pacing was relentless as DI Fawley's team sought to unravel two cases simultaneously. It really was edge-of-the-seat stuff! I highly recommend. The Kindle edition of No Way Out, DI Adam Fawley #3, is due in late December 2018, with the paperback to follow mid-January 2019. My thanks to Cara Hunter, NetGalley and Penguin UK for providing a copy of this book. No one knows who they are - the woman can't speak, and there are no missing persons reports that match their profile. And the elderly man who owns the house claims he has never seen them before. The inhabitants of the quiet Oxford street are in shock - how could this happen right under their noses? But DI Adam Fawley knows that nothing is impossible. I'm lucky enough to live in the city I write about. Oxford will be familiar to crime fans across the whole world because of the fabulous Morse novels and TV, but my version of the town is a long way from the beautiful ivy-clad colleges. A much edgier place where the crimes are darker and closer to home. 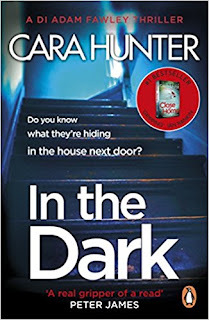 I've always been a voracious reader and viewer of crime - I've learned so much from the outstanding writing that we now see on crime TV like Line of Duty or Broadchurch, and I've tried to recreate the experience of watching series like that for my readers. I love true crime TV as well - my husband used to tease me about it but now just nods sagely and says 'research'!